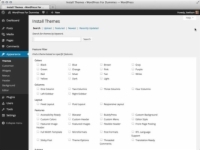 1Click the Themes link in the Appearance menu of your WordPress Dashboard. 2Click the Add New button at the top of the Themes page. This opens the Install Themes page. 3Search for a new theme. On the Install Themes page, you can search for a new theme by keyword, author, or tag. You can also further filter the results by using the Feature Filter check boxes, which allow you to filter theme results by color, columns, width, features, and subjects. After you search for a new theme, the search results page displays a list of themes for you to choose from. 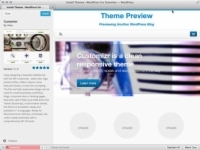 Click the Preview link underneath the theme of your choice to view a sample of how the theme looks. 5Install a new theme on your blog. After you find a theme you like, click the Install button located at the top left of the theme preview window to install the theme on your blog. This installs the theme and loads the Installing Theme page on your Dashboard with a message telling you that the theme installation was successful. Click the Activate link shown on the Installing Theme page to activate, display, and use the new theme on your site. The only themes found in the official WordPress Themes Directory are free and vetted by the WordPress folks; you can trust that these themes are not only free of charge, but also free of any virus or malicious code. The same holds true for the themes you find by using the Add New Themes feature on your WordPress Dashboard. This feature hooks into the official WordPress Themes Directory, so you are sure to find only those themes that are free and safe.